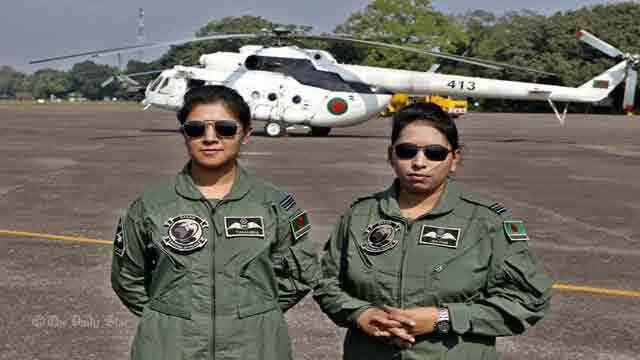 Dhaka, Dec 4 (Just News): Bangladesh’s first ever female military pilots have joined the peacekeeping mission of United Nations in Congo, the defence ministry said today. In a press release of the Inter Services Public Relations, it declared the deployment of Flight Lieutenant Nayma Haque and Flight Lieutenant Tamanna-E-Lufty. The two pilots were selected considering all the professional risks and challenges and after necessary selection process of Bangladesh Air Force. After completing 65 hours of basic helicopter conversion training, they performed duties in different operational squadron of Bangladesh Air Force, the press release said. Flight Lieutenant Tamanna, a student of BAF Shaheen College, was born in June 05, 1993 in Jessore. She was commissioned on December 1, 2012. Flight Lieutenant Nayma, student of Holy Cross College, was born on April 20, 1990 in Dhaka. She was commissioned on December 1, 2011.